I would like to start this post off by apologizing for my absence. Right when I get you hooked on Kitten, I disappear! I know there is no excuse, but basically exams made me become a sad mole-creature that only sat in her apartment and ate dry things out of the cupboard. The good news is that I have recovered. 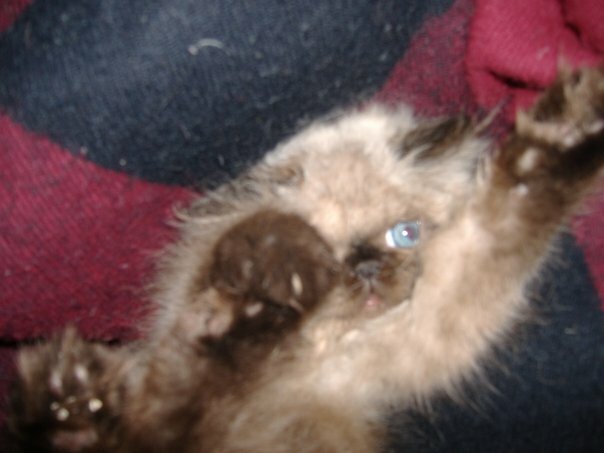 As many of you know, yesterday was the LAST exam, so I can now move on with my life, and my Kitten blog. Considering the season, I thought I would post a Christmas themed blog (though I am sure even if you do not celebrate Christmas you will still enjoy this post). Boyfriend is trying to get Kitten in position for the photo-shoot. Kitten is resisting the Christmas Spirit. We tried to take a nice picture... Boyfriend looks a bit creepy though. Kitten, who was very unimpressed with the whole process, found a way to get his hat off. We soon gave up on trying to look nice. On a side note, this is the one we used in our Christmas cards. Actually, we might have used this one. I feel like both are equally special. We finally got a good one, but Kitten went and ruined it. Over all the photo-shoot was a success. I hope everyone is having a wonderful Holiday and for those of you travelling home, I hope you have/had a safe and hassle free trip. I promise I will post again before Christmas, so please check back soon! You know that awkward stage of childhood where even the cutest kids get really ugly for a year or two? (No? Maybe that was just me.) 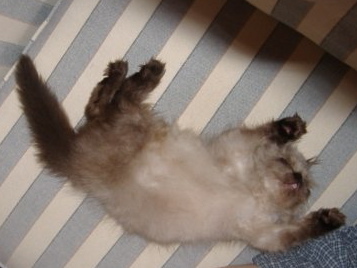 Kitten however, definitely went through that same stage. I know, I know, you probably don't believe me since Kitten is just so darn handsome at his ripe age of two, but I have evidence. I hope you enjoy this look back at Kitten's uncomfortable stage. 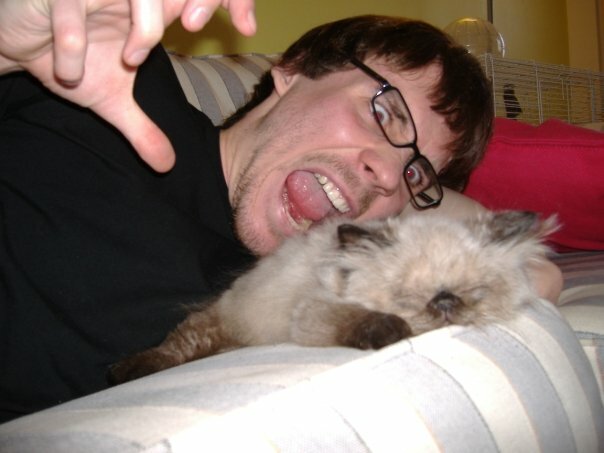 I know people always think that kittens are just the cutest, but now you have empirical to prove them wrong. 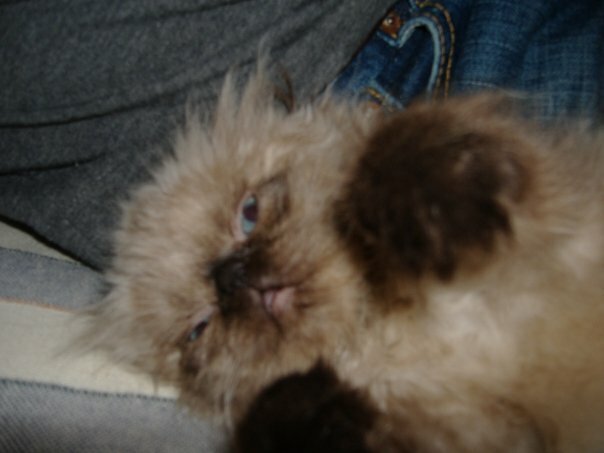 I think Kitten's ugliness as a kitten made us love him even more. 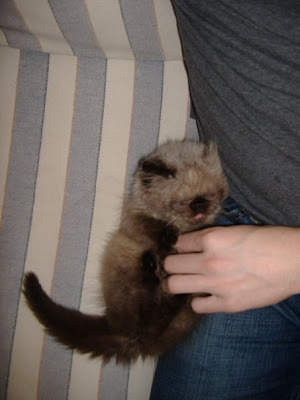 He was such a little ragamuffin that it was impossible not to love him. He may have been an ugly duckling, but he has since grown into a slightly less ugly, straggly, angry swan. And once again, my favourite last. It's the night before the big contracts exam, so what am I doing? Posting a Kitten blog of course! 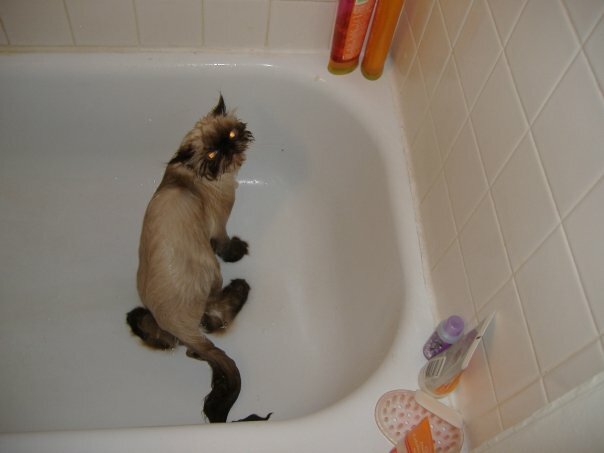 As I have mentioned before, Kitten has a personal hygiene problem. He doesn't quite know how to bathe himself properly (I think he gets this from Boyfriend), so from time to time, he needs a bath. 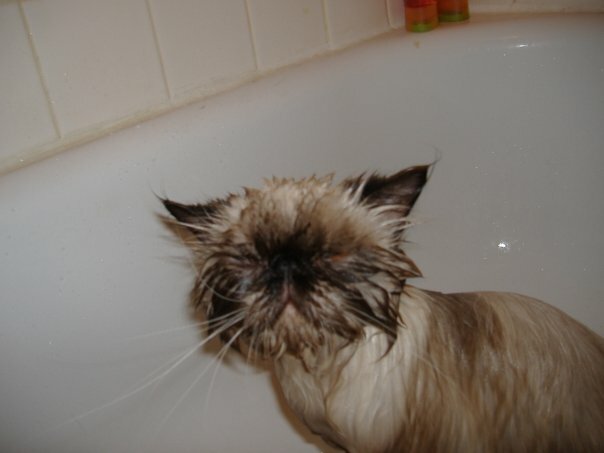 The one thing Kitten does have in common with other cats is his intense hatred of being wet. 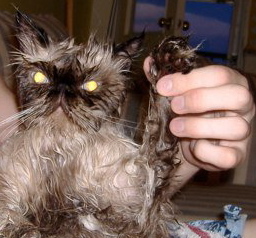 Unfortunately for Kitten, being wet isn't the only horror he sufferers when getting a bath. 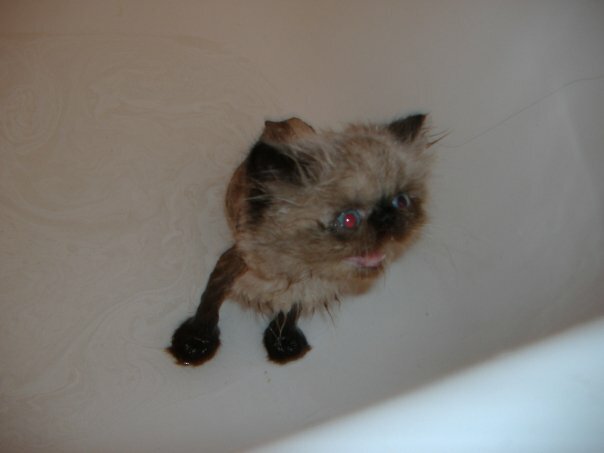 Kitten also needs to be blow-dried afterwards. If he isn't, he gets mouldy and matty, and we try to avoid letting mouldy matty things live in out apartment with us. 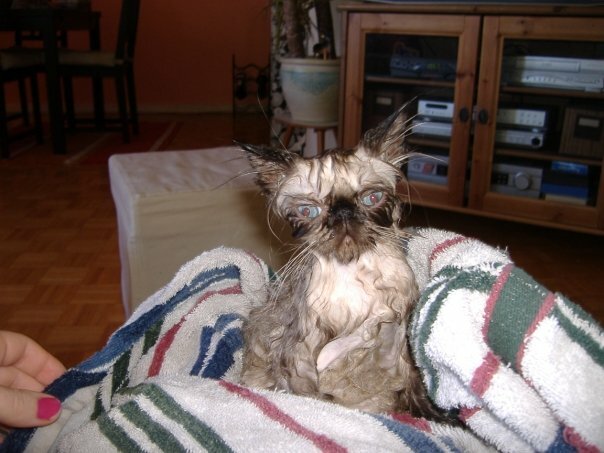 If there is one thing Kitten hates more than being wet, it's the hair-dryer. For all of my fellow studiers I hope you get a moment of joy out of this. I think he might want out. 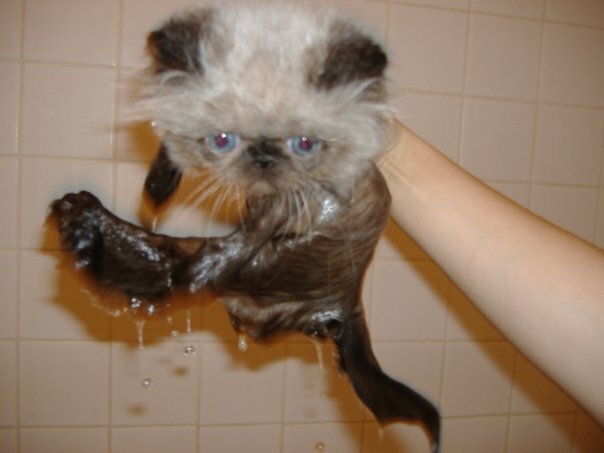 This is what needs to be done to dry Kitten. 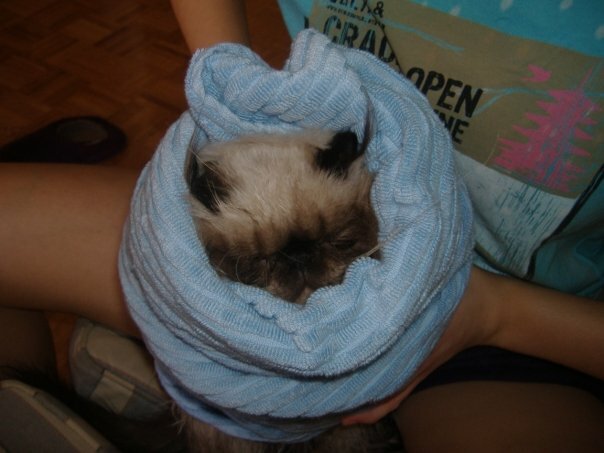 We have to wrap him up and dry him bit by bit so he can't escape. Sometimes he does, and then he retaliates. It's best just to make sure he doesn't escape until it's over. I saved my favourites for last! You know what is more enjoyable than learning about Undue Influence? Welcome to the very first Kitten post! Kitten was my Christmas present from Boyfriend two years ago, though we actually picked him up from the breeder on my birthday On the way over I had visions of returning home with one of those kittens in the toilet paper commercials. 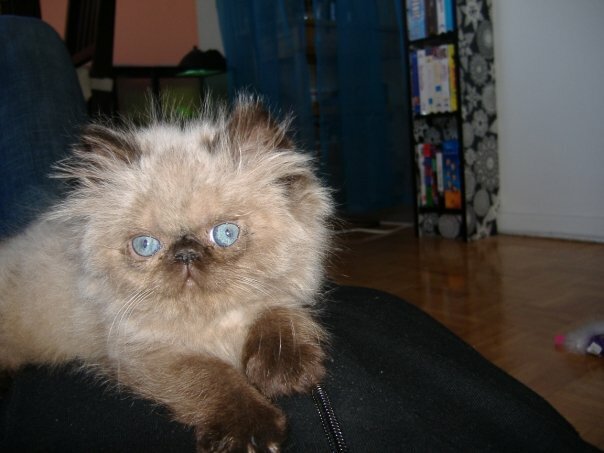 It was pretty tough choosing anyone of the kittens out of a Himalayan-Persian litter. They were all so adorable and cuddly and fluffy. And then, there was Kitten. 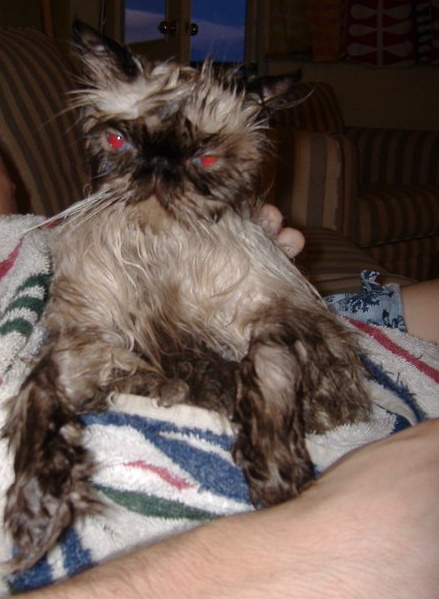 He was alone and straggly and greasy, by far the ugliest of the bunch. We knew instantly that he was the one for us. We got Kitten home and he immediately fell asleep trying to climb out of his litter box. 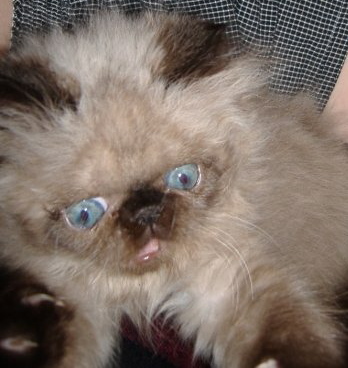 As my future posts will make clear, Kitten isn't exactly normal. 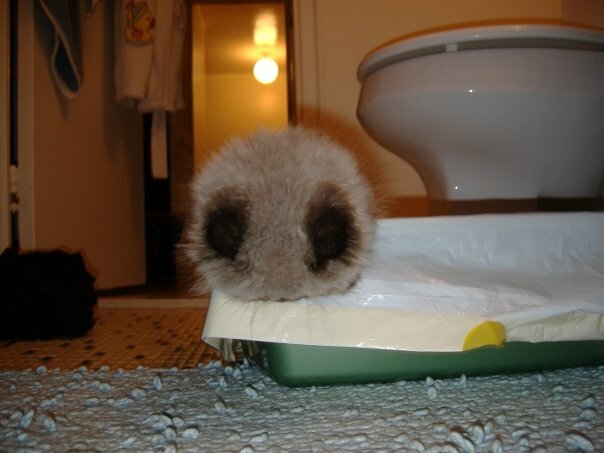 But looking back on his kittenhood, I think Boyfriend and I might have had something to do with that. 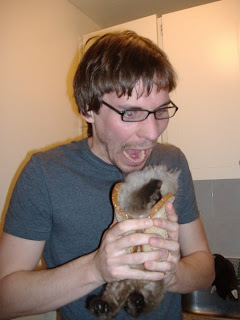 Our first idea as the proud new care-givers of a little living creature was to put it between two slices of bread and pretend it was a sandwich. I do promise you though that kitten was not harmed in anyway. He actually really enjoys bread... and cheese... and Nibs. 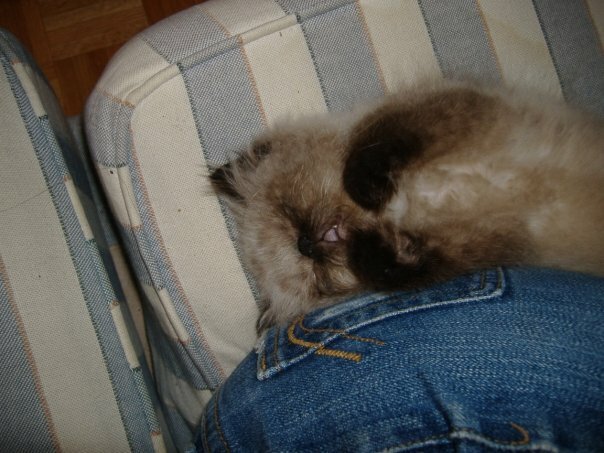 Kitten also had quite the walleyes as a kitten. He was our little Marilyn Monroe if you will. 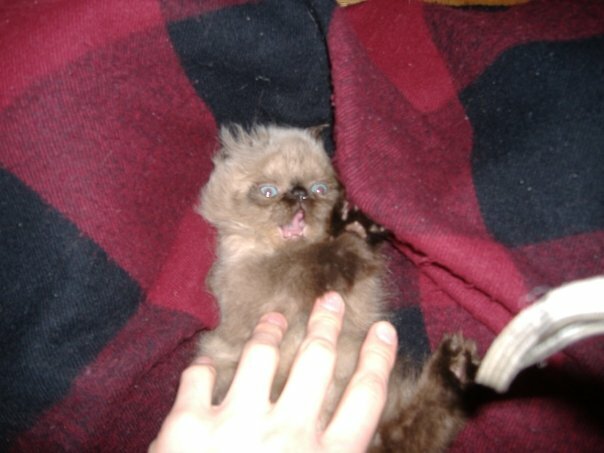 Kitten was in fact a very well tempered kitten. 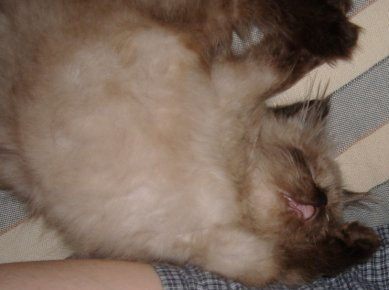 He never caused troubles, never whined and loved to sleep on the end of our bed. The real trouble began when Boyfriend started play fight with him. 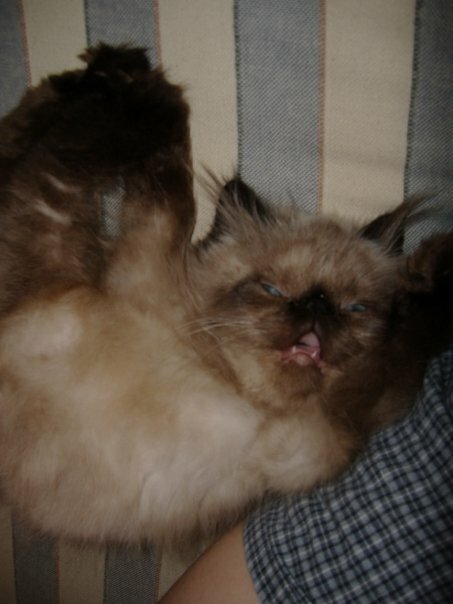 I tried to explain that it was cute now, but when he grew up and developed real teeth and claws, it wouldn't be so fun. Of course Boyfriend did not listen and now we have a large and very agressive Kitten on our hands. 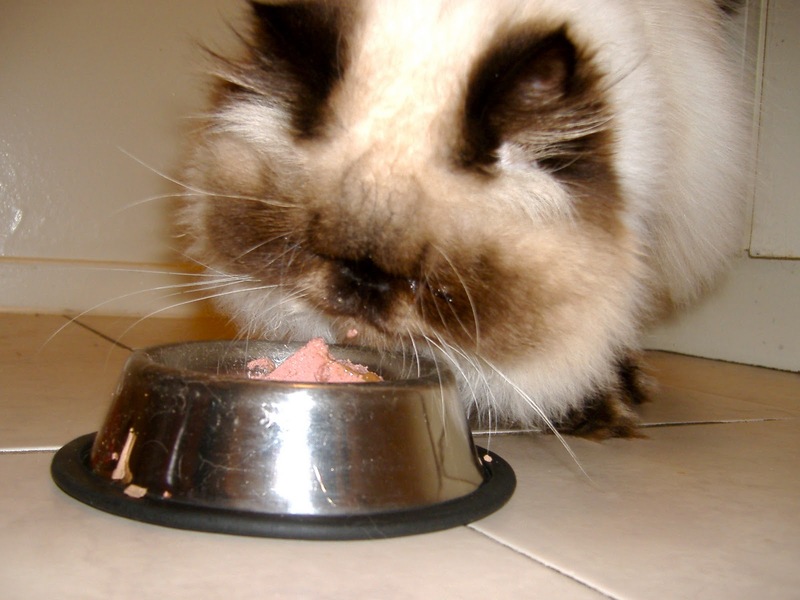 This is of course only a very brief introduction to Kitten. 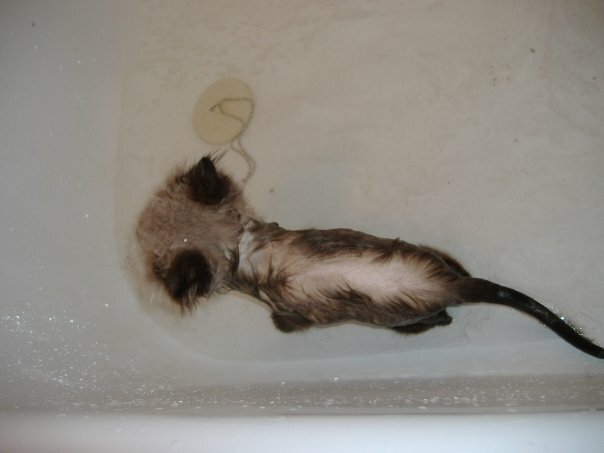 You'll get to hear all about adult Kitten in a bit, but for now I will leave you with a picture of Kitten's first bath. He didn't enjoy it.